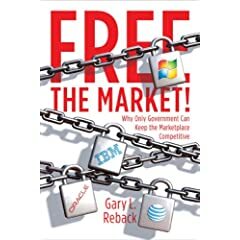 Gary Reback, famed antitrust/IP lawyer and long-time thorn in the side of Microsoft, has written a book entitled “Free The Market!”. The book will be released in mid-April and is available on preorder at Amazon now. Based on a few excerpts on Reback’s web site it looks like this will be an anecdotal, “in-the-trenches” book (as opposed to theoretical/academic) that should be well worth reading for those interested in the antitrust/IP wars of the last two decades. Reback was truly in the center of most of the big cases during these years, and I hope his book captures the legal issues, strategies and behind-the-scenes events that he witnessed. Previous post: "You Assert That a ‘Spike’ is a Non-Pointed Structure Under This Patent? That Will Cost You $4.6 Million, Counselor!"